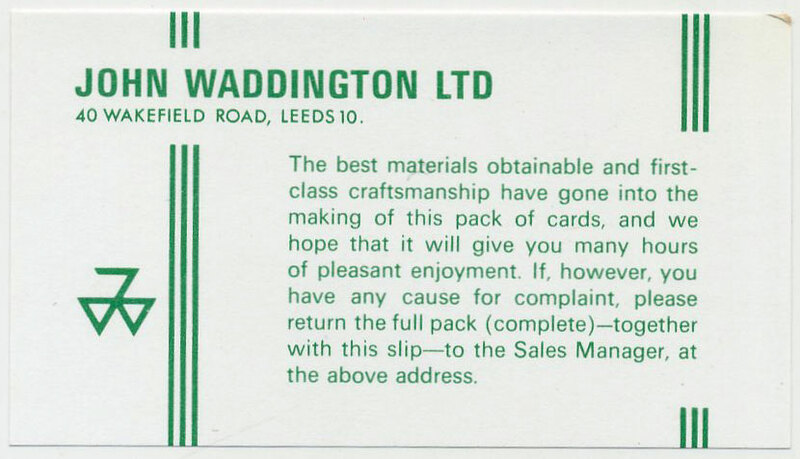 WoPC Home > United Kingdom > Amalgamated P-C Co.
Over the years Waddington's Playing Cards and Games divisions became very fragmented and cards were manufactured at different locations. In 1960 the excise duty on playing cards was abolished, opening the way for foreign imported cards. In 1962 Waddington's and De La Rue therefore joined forces and re-launched the Amalgamated Playing Card Co., seeking to consolidate their efforts in the home market. However, De La Rue's involvement gradually declined so that sales were subsequently handled by Waddingtons and the Amalgamated Playing Card Co. between them. During this period hundreds of packs are known to have been produced for casinos, clubs and general advertising with the legend 'The Amalgamated Playing Card Co. Ltd - Leeds and London' on the ace of spades. In 1971 Waddington's purchased De La Rue's share of APCC, thus becoming the sole manufacturer of playing cards in the UK at that time. Alf Cooke Limited (formerly 'Universal Playing Card Co. Ltd') was taken over by the Amalgamated Playing Card Company Ltd in 1971. The stock and machinery were transferred to Waddingtons. Above: Playing Cards manufactured by Waddington's for The Amalgamated Playing Card Co., Ltd, c.1965-70. The Quality Control Slip bears the name of Waddingtons. 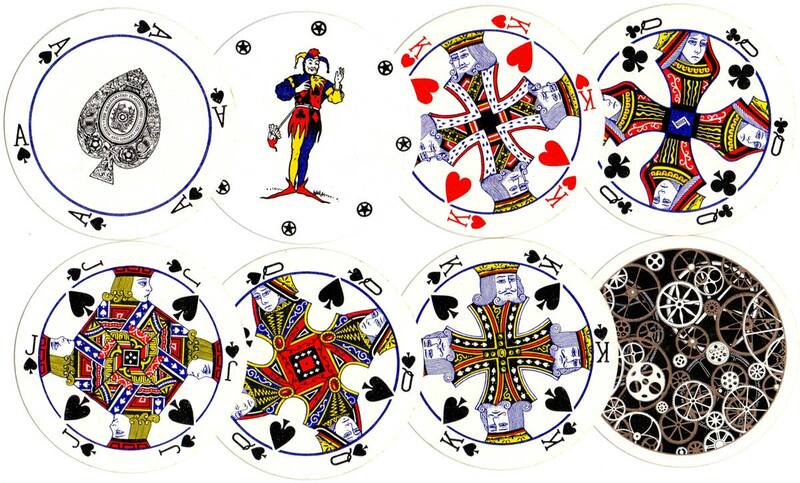 Above: Cir-Q-Lar Playing Cards manufactured by Waddington's for The Amalgamated Playing Card Co., Ltd, c.1970. 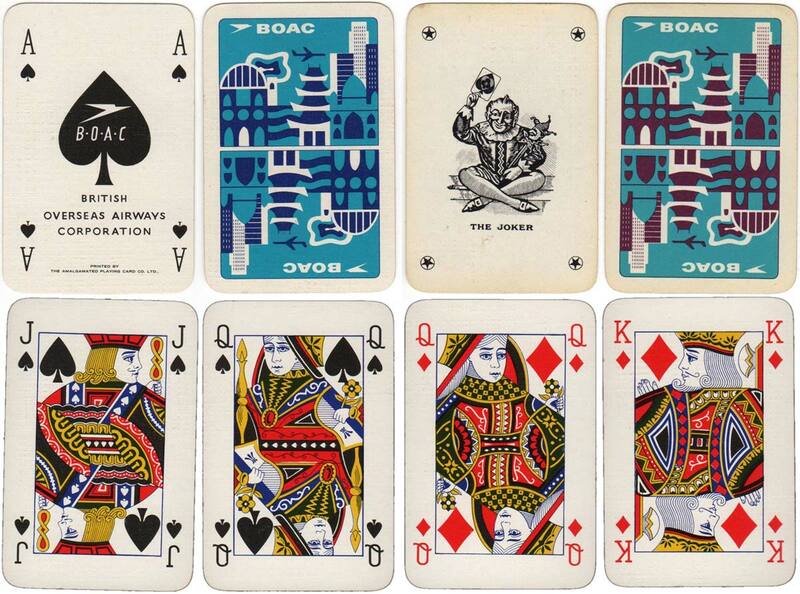 Above: matching patience packs with special aces of spades for B.O.A.C., c.1970. Image courtesy Matt Probert.